"Netvibes' greatest benefit to our company is that we can monitor everything constantly. Being able to compare our performance against competitors in real time adds great value to our company." Q: What is the most cost-effective way to market my brand against competitors? The top online influencer for guiding the online conversation and increasing brand awareness was Dairy Product Brand’s very own Twitter account. O: Live dashboard charts kept the digital team apprised of campaign outcomes. While a competitor brand was officially sponsoring the Top Chef show, Dairy Product Brand used low-cost guerilla marketing tactics to hijack the social media conversation and steer customers toward its own brand. Global food brand, Dairy Product Brand [real company name changed], uses Netvibes dashboards to track all digital conversations concerning the brand and related topics across social networks, images, press and media. Using real-time analytics, Dairy Brand monitors the success of its digital campaigns, keeps track of what is happening in the industry and identifies prime marketing opportunities for reaching target customers. As a result of using Netvibes market intelligence, the company has maximized the success of its marketing campaigns and has surpassed larger competitors in visibility among key online audiences. Global companies in the food industry face the challenge of listening to diverse customer feedback and optimizing marketing strategies across many different regions. With a limited marketing budget to compete against bigger brands, Dairy Brand wanted to know: "What is the most cost-effective way to market my brand against competitors?" To measure campaign effectiveness, Dairy Brand customized a Netvibes dashboard to track metrics for all its social media activity, including the outcomes of different digital campaigns and the impact on internal KPIs such as sales and web traffic. 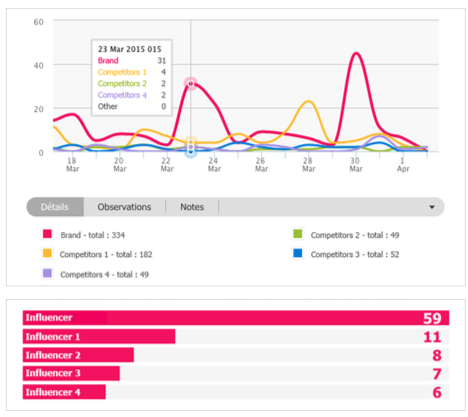 For example, the dashboard analyzed the effectiveness of Dairy Brand's online marketing campaign around the Top Chef TV show. Although a competitor brand was the official paid sponsor of the show, Dairy Brand's marketing team was actively engaged on social media during each episode, live-tweeting and conversing with viewers in order to hijack the online conversation and steer customers toward its own brand. Netvibes enabled the company to automatically track the results of the campaign, as well as compare word-of-mouth performance for the brand versus competitors. The dashboard compared social mentions for both brands during the TV show’s airing each week. As seen in the chart below, the data revealed that Dairy Brand was mentioned far more often on Twitter, despite the fact its competitor was the show’s official paid sponsor. Because of the company’s guerrilla marketing tactics, the brand enjoyed increased visibility at virtually no cost, while the competitor spent money on TV advertising that yielded minimal gains. The dashboard also enables Dairy Brand to identify online influencers responsible for triggering viral trends. This intelligence allows the marketing team to react quickly to take advantage of news cycles and the latest trends. The Netvibes dashboard instantly alerts the marketing team in response to specific keywords or data trends, such as when negative sentiment on Twitter increases above a certain threshold. As a result, Dairy Brand is always the first to know when something happens and can react in real time. Using dashboard intelligence, the brand can strategize and act quickly to prevent brewing PR crises from spinning out control. With Netvibes, Dairy Brand analyzes its digital activities and tracks metrics in real time across the Internet. Using simple, drag-to-compare analytics, Dairy Brand actively monitors KPIs for web traffic (connected live to the dashboard from Google Analytics) in relation to the brand’s marketing spending and activity. As a result, the company can easily quantify the traffic generated by each campaign. The dashboard also enables the company to identify its top sources of web traffic — an important insight that helps shape marketing strategy and allows the brand to focus on channels with the highest ROI. "Netvibes' greatest benefit to Dairy Product Brand is that we can monitor everything, constantly. "With Netvibes' comparative data charts, we can easily analyze vast amounts of social and marketing data, and then adjust our digital content strategy accordingly. Being able to aggregate all digital data onto a single dashboard saves us an hour of digital media and news monitoring each day." "Additionally, Netvibes' real-time feature allows our team to stay current on the latest news. We can see how real-world events impact our brand image and reputation."